Because you’ll want to eat THIS stuffing for breakfast, lunch, and dinner. Yep. It’s just that good. Yesterday I was out for a very quick and very chilly 6-mile run during my lunch break (one of the many perks of working right by the Charles River) when I started thinking about what to make for Thanksgiving. I absolutely love experimenting in the kitchen and testing out new recipes around the holidays– there are just so many cozy ingredients to use in such a short amount of time! Plus, the holidays provide me with LOTS of willing (perhaps unsuspecting?) taste-testers and food critics to impress . I don’t know about you, but I come up with some of my best ideas while working out– especially recipe-related ideas (I guess I just get reallllly hungry burning off all that energy ). It’s no wonder, then, that I came up with this amazing recipe right around mile four as I was passing the Mass. Ave Bridge. Now, my aunt who hosts Thanksgiving (and pretty much every other holiday!) is a regular Martha Stewart through and through. From the food being served to the table decor, she has the whole Thanksgiving spread thing down to a science. 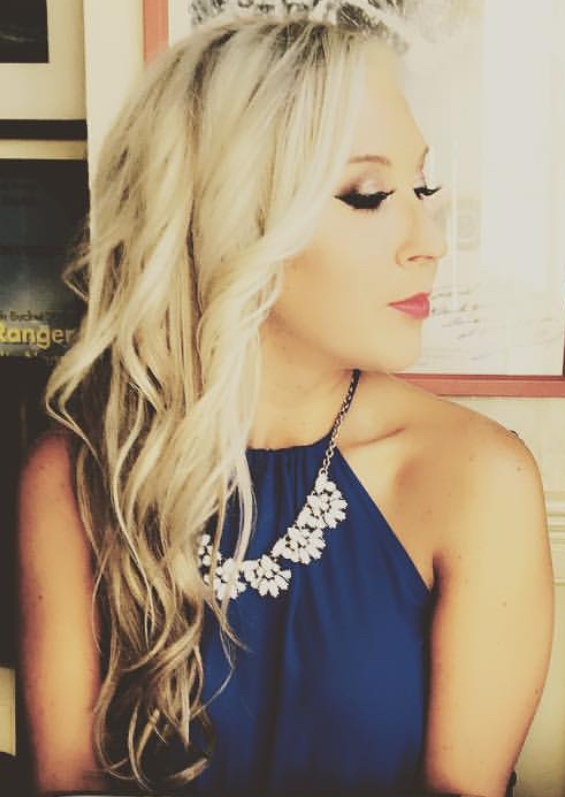 If there’s a traditional Thanksgiving dish to be found, you can bet it’s on her table! Therefore, the last thing I wanted to do was step on her toes or throw off the system by bringing a repeat Thanksgiving dish. 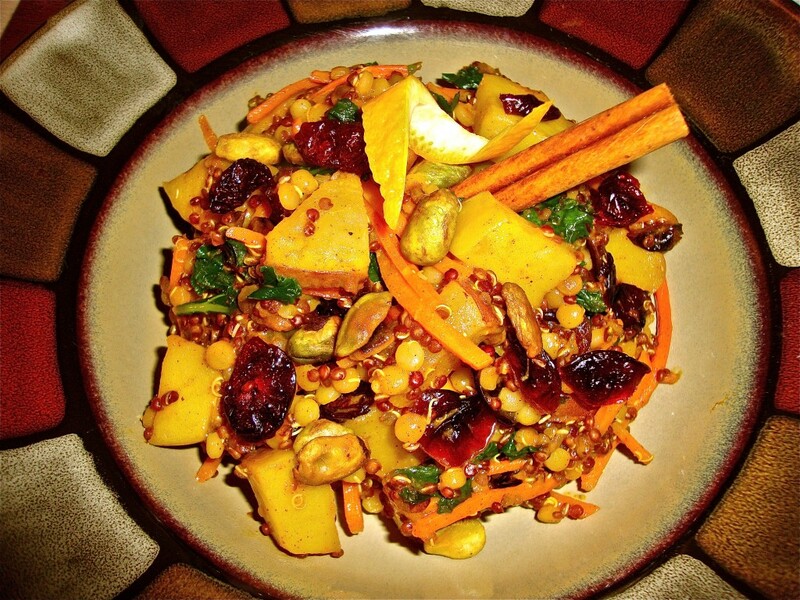 That meant traditional stuffing was out, and my healthy, vegan, spiced-up “stuffing” was so IN. Since I won’t be getting my protein from the Thanksgiving turkey like the rest of my family, I knew I wanted to whip up a tasty dish that would be both filling and protein-rich. Quinoa was the obvious choice here– just 3.5 ounces packs 14 grams of protein! However, since some members of my family (especially the boys) can be pretty picky, (I can hear them now… “QUIN-WHAT? 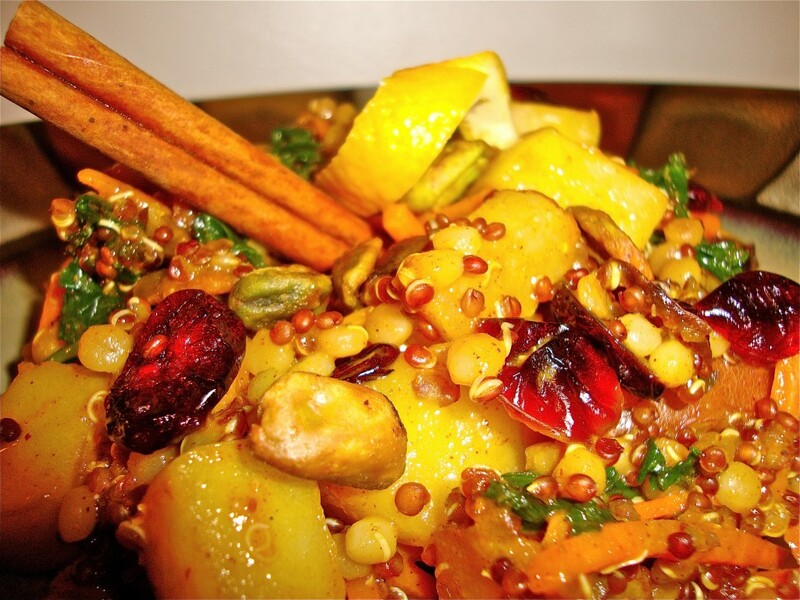 ?”) I wanted to balance this healthy grain with something a little more familiar, like couscous, to please all palates. This dish is sure to be an instant crowd-pleaser! 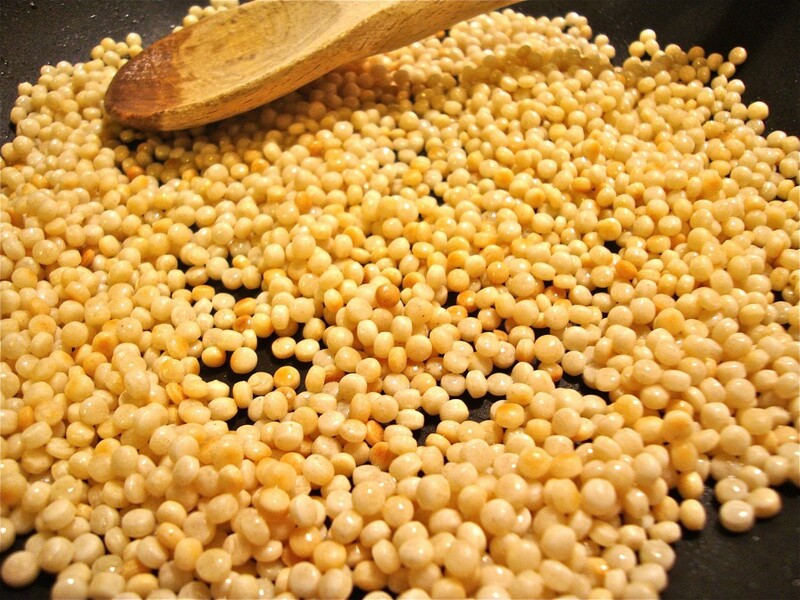 Heat one teaspoon of coconut oil in a medium skillet and toast the couscous until lightly browned. Remove from heat. 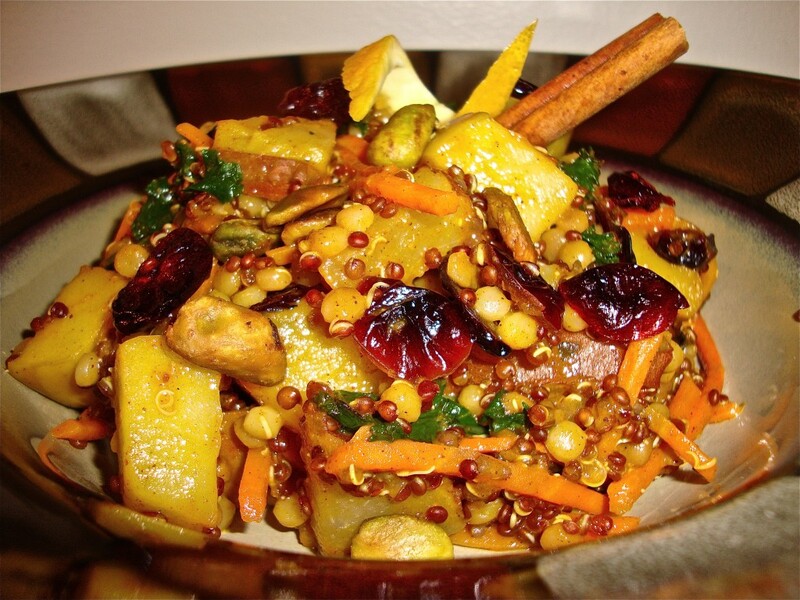 Pour carrot juice and vegetable broth into a medium pot, then add toasted couscous, quinoa, and cinnamon stick. 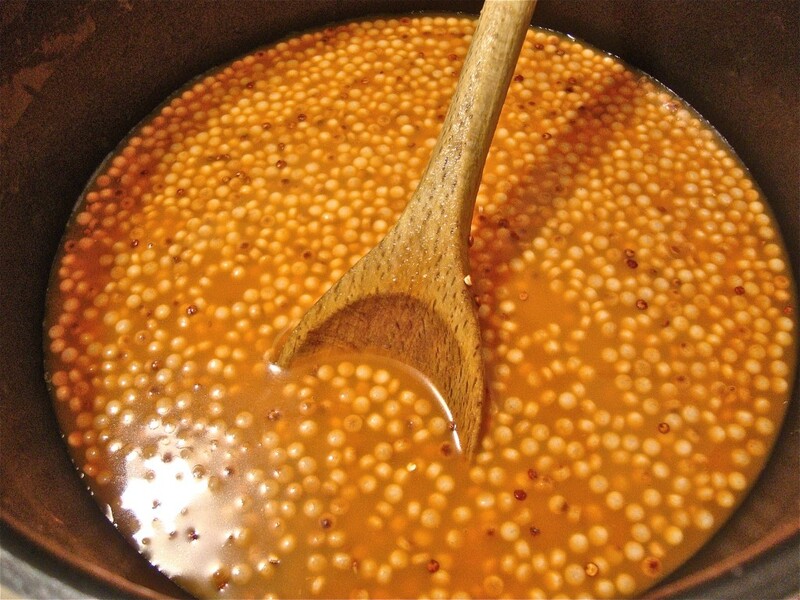 Bring the mixture to a full boil and then reduce heat to low. 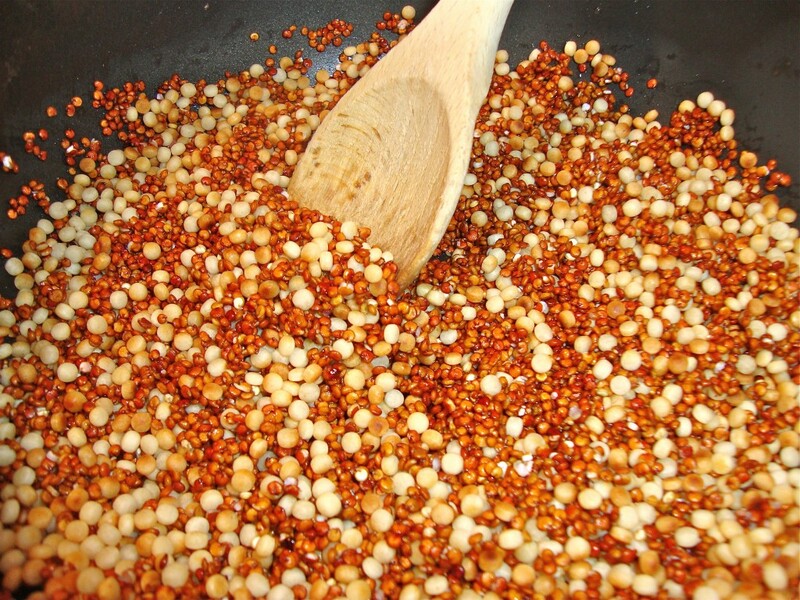 Simmer for 10-15 minutes (until quinoa is fully cooked and little white sprouts appear). Remove cinnamon stick. Mix 1/2 teaspoon of pumpkin pie spice and 1/2 teaspoon of cinnamon to cooked stuffing mixture. 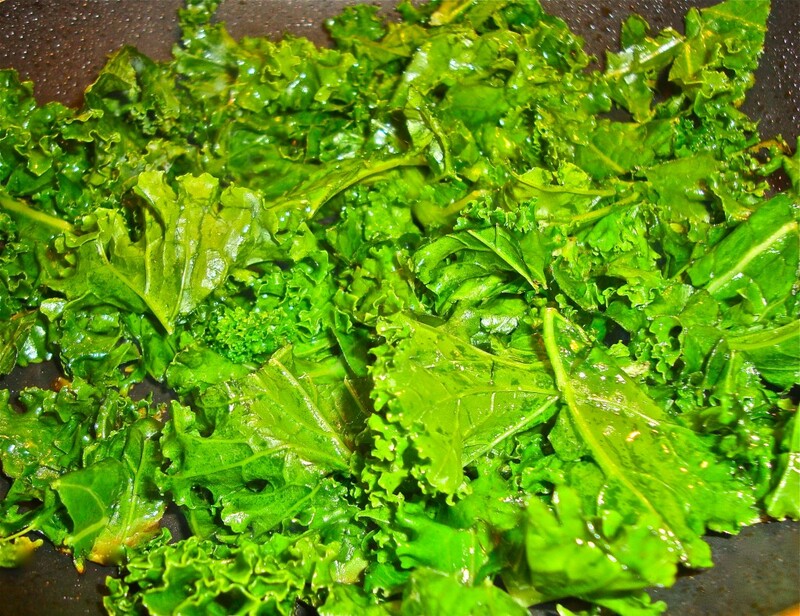 In a medium skillet, heat one teaspoon of coconut oil. 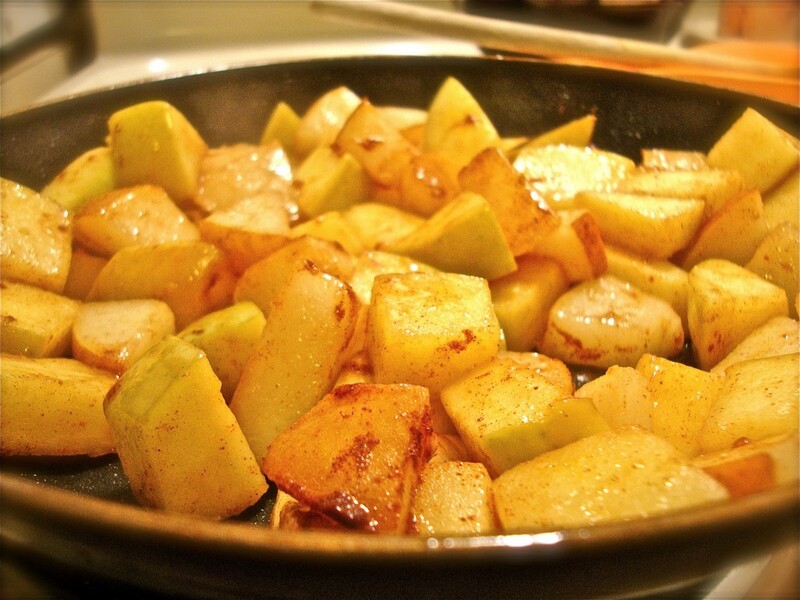 While oil is heating, toss apple and pear chunks with 1/4 teaspoon of cinnamon and 1/4 teaspoon of pumpkin pie spice. Turn heat to medium high and add apple/pear mixture. Cook until fruit becomes soft and sticky, then add the fruit mixture to the stuffing mixture. In same skillet, heat one teaspoon of coconut oil on medium heat and sauté kale until wilted. Add the kale to the stuffing mixture. 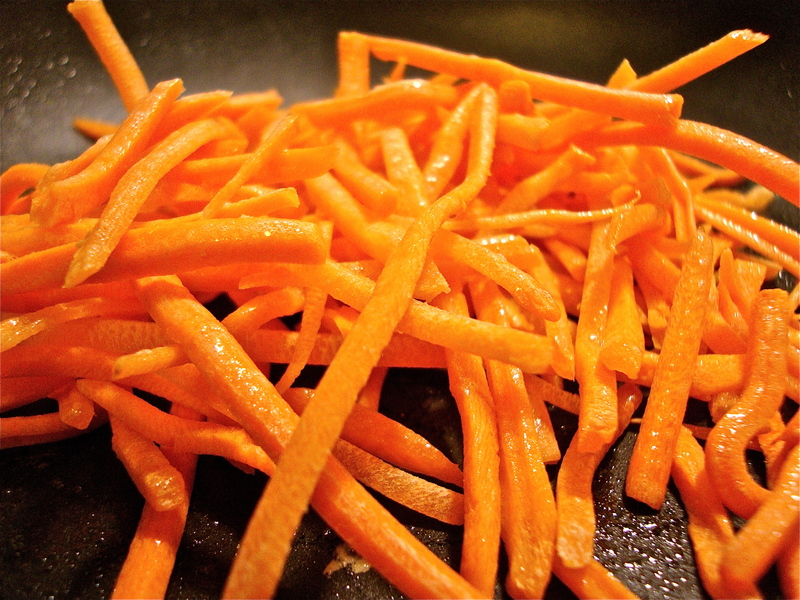 In same skillet, heat one teaspoon of coconut oil on medium heat and sauté shredded carrots until soft and wilted. Add the carrots to the stuffing mixture. 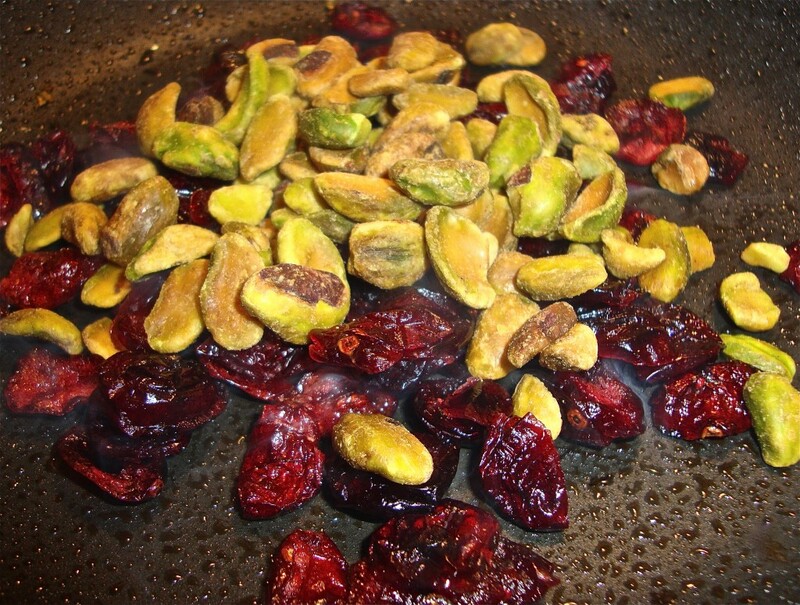 While the pan is still hot, add the dried cranberries and pistachios. Quickly stir the mixture around until cranberries are soft (30 seconds or so). Add the cranberries and pistachios to stuffing mixture. Squeeze the juice from half of an orange into the stuffing mixture and season with ginger, black pepper, and cayenne pepper (to taste). Garnish with a cinnamon stick and an orange peel. NOTE: If stuffing is too dry, add a splash of carrot juice or vegetable broth to moisten it up a bit. Go ahead. Stuff yourself . This entry was posted in Food for Thought, Uncategorized and tagged carrot, Christmas, cinnamon, dried cranberries, healthy holiday, healthy quinoa, healthy side dishes, holiday couscous, holiday quinoa, holiday salad, holiday side dish, holiday stuffing, kale, pistachios, Thanksgiving, vegan stuffing. Bookmark the permalink.